Beginning today, July 26, we are packing, unpacking and moving our small office from Montebello Drive to our new space at 322 N. Tejon Street downtown. Our mailing address will not change. It will continue to be PO Box 2085, Colorado Springs, 80901. If you’re looking for a short-term volunteer opportunity, we have just the thing for you. Email RoMa for details. Although our phone number will remain the same, we will be almost entirely inaccessible via phone until August 1. During this time, we encourage you to contact us via email, rather than relying on consistent phone service. Beginning August 6, we’ll be doing business from a central downtown location and we welcome short drop-in visits from supporters and friends. We will be scheduling an open house this fall. Sign up for alerts in the upper right corner of our website and watch your inbox for details. Thank you, friends! We’re excited to share our new space with you! 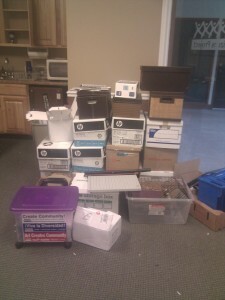 No Replies to "Citizens Project office move: What it means for you"